How To Make Money Online ...:::: Earn Methods ::::... today we are going to make high quality "E-mail Subscribe Box" your Blog visitors to Subscribe your blog and you Get more traffic on your "Site or Blog"
just still back and relax because you do not have any high work to get subscribe box. because you are use blogger platform, and my advice to you, just use blogger Gadget. Because if you use any other "Heavy" Gadget, your "blog" speed are very slow. so my advice is for you, use blogger Gadget only for your blogger blog. and happy blogging. if your site speed are slow and visitor don't like this, and they Bounce your site. and your Bounce rate is High. so you just use clean and light Gadget to your blog. 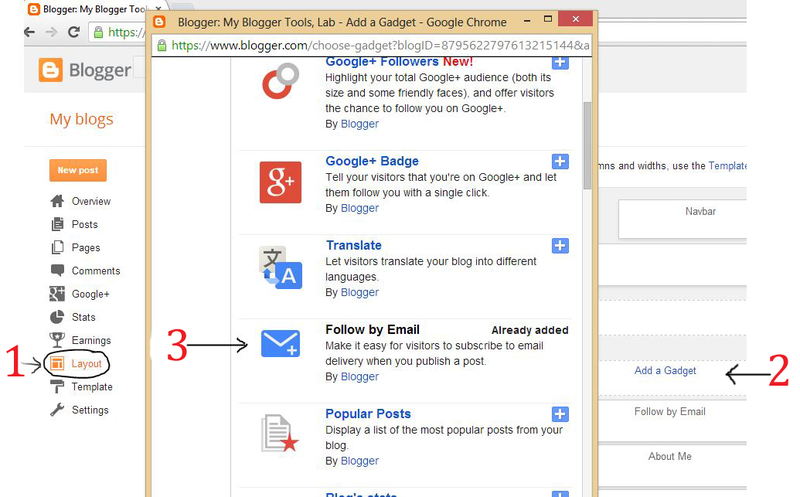 now i show you how to place you blogger E-mail Subscribe Box, just for easy three steps. see this image below. 2: then press "Add a Gadget"
3: and add "Follow by Email"